Enjoy the white sand beach around Hotel Bakoua, to offer yourself moments of unwinding and relaxation. Thanks to its ideal location, at the heart of a tropical garden and facing the sea and the superb bay of Fort-de-France, this 4-star property at Trois-Ilets offers you a heavenly decor to enjoy farniente vacation during your stay with your family, friends, as a couple or on the occasion of a business trip. Sunshades and deckchairs are at your disposal for these moments of relaxation. Hotel Bakoua makes a nautical activity centre close to the beach available to you: paddle, fly board, kayak, or tubing. You will be spoilt for choice with many possibilities offered to you to relax and have fun. Hotel Bakoua is the perfect vacation resort to discover the unique beaches which make up the reputation of the island: discover for instance the sumptuous Diamant beach or the beaches of Anse-d’Arlet (Anse Noire, Anse Dufour, Grande Anse, Petite Anse) for changes in scenery and total wellbeing. The lovers of cultural discoveries will not be left behind: the region boasts places steeped in history which are worth a visit. The park of Savane des Esclaves hosts the traditional dwellings and huts of the early 20th century. Walk around this natural space and admire the numerous species of tropical plants as well as the local fruits and vegetables. Discover the Village de la Poterie with its typical and traditional Martinique architecture and local crafts. One of the oldest brickworks of France welcomes craftsmen in Creole houses and invites to a relaxing walk through the different stores and exhibition spaces. Finally visit the Pagerie museum, a 17th century mansion in which Empress Joséphine was born in 1763. The place used to be a cocoa, sugar cane and cotton farm. The museum exhibits personal items that belonged to Joséphine de Beauharnais. Catamaran ride (every day, from Pointe-du-Bout): an authentic way to admire the natural splendours of the island, in a convivial atmosphere, during a comfortable navigation on a catamaran, with all the charm and character. On the menu: sailing, farniente, bathing, snorkelling, gourmet meal served on board, fruit juices and planter cocktails at discretion. North Atlantic (Wednesdays and Saturdays, from Fort-de-France, accessible by maritime shuttle from Trois-Ilets): this excursion will make you discover the north of the island. It proposes a crossing of the capital Fort-de-France, a photo stop at the Balata church (miniature replica of the Montmartre basilica in Paris), a visit to the botanical garden of Balata with thousands of plants and shrubs from the tropical forest. The circuit is continued along the green route de la Trace towards the city of Saint-Pierre and a visit of the remains of the city destroyed by the eruption of the Mont Pelée volcano in 1902, then a créole lunch at a restaurant on the slopes of the volcano before reaching the Atlantic coast via Morne Rouge and Ajoupa-Bouillon, very fertile regions and finish with a visit to a distillery with a tasting at the North Atlantic. This capital city, located across from Hotel Bakoua, on the other side of the bay, will unveil its charms during an excursion. 15 minutes by boat from Pointe-du-Bout (2 minutes from Hotel Bakoua) or 35 minutes by road, Fort-de-France is a bustling and colourful city. Visit the fish market and the big covered market to take in the local scents: spices, vanilla, rums, peyi vegetables… Continue your visit to the departmental museum of archaeology and prehistory presenting the story of the native Americans with an important collection of art works and pieces and the museum of regional art and history in a former Créole house to discover the history of the island. Above the town of Fort de France, moments of relaxation in the heart of nature will round off your excursion in the Balata gardens: a green oasis with more than 200 species of tropical plants along a path and above the tops of the trees. The Golf de l’Espérance – the only one of Martinique in Trois-Ilets: an opportunity to admire the sceneries with a mix of blue sea, hills and palm trees whilst discovering the 18 hole course created by the American Robert Trent Jones. 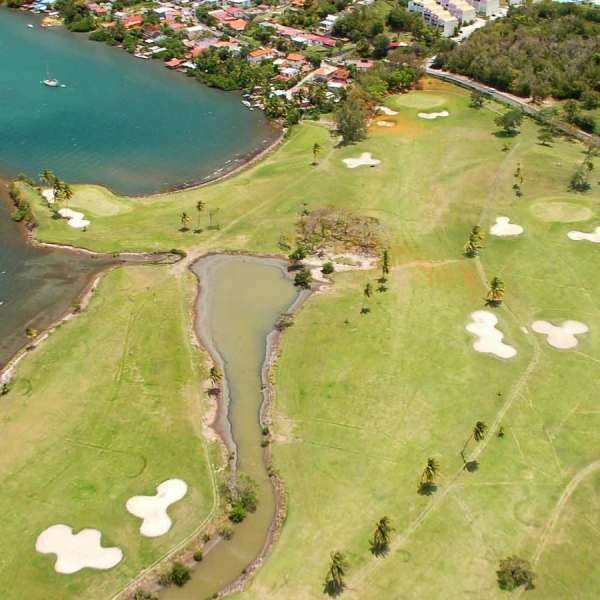 This golf course, situated in the bay of Fort-de-France, will convince experienced players and will allow beginners to initiate themselves in a unique setting. The hiking lovers will enjoy the “flowery island”. Martinique can be discovered on foot, along trails which will take you to typical villages, through lush tropical forest on land or along the coast. Martinique has approximately 180 km of itineraries, adapted to all the levels. Discover the hiking trails.